Not all of us can spend up to a thousand dollars for a paddleboard. The costs of renting can also be heavy in the long run. That’s why many prefer to shop for a cheap paddle board for a tighter budget. In case you’re searching for a higher-end paddle board, have a look at my 15 best inflatable SUP reviews. Going on a budget does not always mean you have to forego the quality and performance you’d expect from an inflatable paddleboard. Sometimes, going on a budget means you just have to be more critical to shop for a board that is worth every dollar. Also see the Cheapest Paddle Boards Under $300, $400 and $500. In this article, we’ll be telling you our choice when it comes to shopping for a cheap paddle board on a budget. They may come at a lower price but they come with the quality and performance you need to enjoy your paddling sessions. The Bestway SUP is a light and flatwater inflatable paddle board perfect for beginner and intermediate paddlers who weigh up to 220lbs. It is a all around SUP Board, making it perfect for long periods of paddling and exploring local waterways. Included in this package is the board, a 3-piece aluminum paddle, a repair kit, foot pump with gauge, removable fins, and a bag to store it all in. The board also comes with a built-in carry handle that allows easy transport. The paddle can be adjusted in 2 length settings. Removable fins include two modelled side fins and one center fin for tracking. It takes you about 5-8 minutes of unhurried pumping to get the board up to proper PSI of 12. As you carry it to the water, you will find it very light. Also, you will find it very easy to maneuver because of its narrow shape. The board has an anti-slip traction pad so you can move without having to worry about slipping. You don’t have to worry about the durability because of its drop stitch material that strengthens the board. Read our Bestway Paddle Board Review. 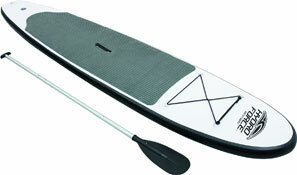 The PathFinder Paddle Board is a great SUP package for riders up to 240lbs. With this board, you can leisurely paddle along flat waters. It is also perfect for family fun and yoga-on-water (YOW). The SUP package includes a 9’9″ SUP board, air pump, detachable center fin, bungee tie-down, a ring for attaching a leash, and an adjustable aluminum paddle. The board comes with a large anti-skid area offering you more stability for paddling and better movement on board. Inflate it up to 15 PSI and enjoy paddling with this rigid inflatable SUP board. The PathFinder is inflatable, so it’s easy to transport and store. It may be the cheapest in our list but that does not mean it’s an inferior board. The PathFinder is made of PVC and has a strong multi-layer drop stitch. The material and making of this item allows you to enjoy a rigid enough inflatable SUP. Read more about the Pathfinder Paddle Board. The Solstice Fiji is the perfect paddle board for lightweight paddlers, and even kids! This board is recommended for paddlers that weigh up to 175 lbs. You might be someone who likes to do yoga or wants to give your kids an awesome summer present. If so, good news! The Solstice Fiji Lightweight is for you and costs a lot less than other boards currently in the market. Along with your purchase, you get the following: the 8-foot inflatable SUP board, a pump with gauge, stainless tie-downs, and a carry bag. The great thing about this inflatable board is that it is designed to accommodate beginners. It is made up of PVC reinforced fabric material to make it very rigid. Also, it has a 6-inch thick single layer core making it stable enough for paddlers who are still getting used to the watersport. Read more about the Solstice Paddle Board Fiji. When going on a budget and shopping for a cheap paddle board, you have to go through the details and product specs. Below is a table that highlights some of the features of the paddleboards. It is important to check the dimensions of the paddleboards. The length and width say a lot about how a board performs. A longer board means you could paddle faster and straighter. While a shorter board means you could maneuver better and make turns more easily. Width also says a lot about stability. A wider board connotes stability while a narrower board favors speed. For beginners, a wider board is usually recommended. The longest and narrowest paddle board is the Bestway Hydro-Force Wave Edge, so if you’re looking for more speed, consider it your option. The shortest board is the Solstice Fiji, and that means you can make your maneuvers better with it when paddling in slight currents. You should also consider the thickness of a board. A thick board tells you it is more stable on the water. For beginners, the recommended thickness would be at least 6 inches. A thinner inflatable paddleboard means that it is more compact when you roll it up. You definitely should consider how confident you are on paddling and the importance you give to travelling easy. You also want to consider the capacity of the board relative to your weight. You wouldn’t want to paddle on a board that sinks the moment you step on. The weight capacity determines the compatibility of the board for the paddler. If you weigh less than the maximum capacity, that’s great! It gives you the option to bring a few more things (like fishing gear) or even your kids when paddleboarding. Now to sum it all up, the board with the most inclusives upon purchase would be the BestWay Hydro-Force Wave Edge. 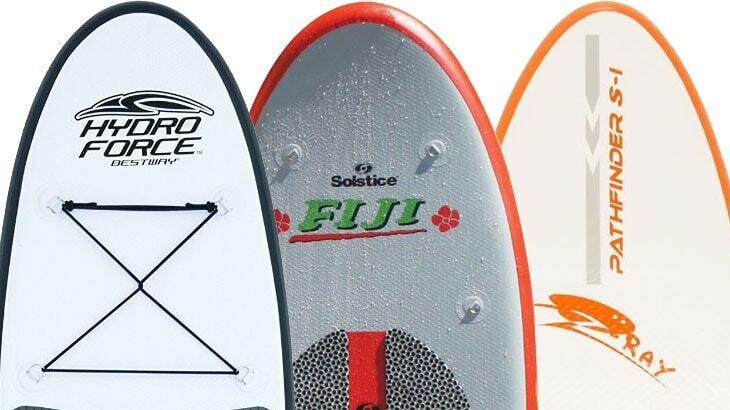 Take note how the Solstice Fiji does not include a paddle. Therefore, keep the price of a paddle in mind when considering it. 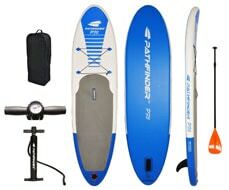 For the board with the most value for your money, we recommend the PathFinder paddle board .